There are a lot of different methods for freezing fresh corn on the cob. They almost all are great methods. Today I'm going to share with you my quick & easy method that has worked for me for over 20 years. I learned it from a farmer one year when he was delivering a load of corn to a food co-op I belonged in, who were splitting a truckload that had been fresh picked just hours before. 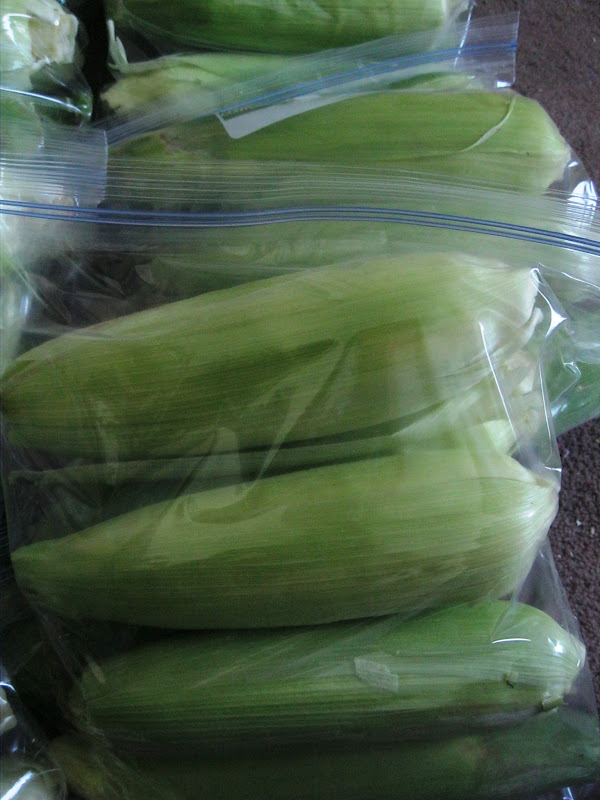 That farmer told me, if you really want to keep the corn on the cob as fresh as possible, leave the husks on, and bag it in freezer bags and get it in the freezer as soon as possible. I asked him why not the need to blanch the corn in hot water first. 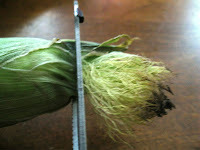 He promised me that if the corn was super fresh, just picked, like at a farmers market, then leaving the husk on will work just fine, but if you are buying corn on the cob that might be a few weeks old, say from a traditional grocery store, than blanching it first will be better, as it has already lost flavor and color. Blanching, which is cooking the corn on the cob in boiling water for 1-3 minutes will stop an enzyme that breaks down flavor and color. You then plunge the corn in ice water to stop the cooking process, and when it is cool you can cut it off the cob to freeze it or leave it on the cob and freeze it. Most people will tell you that if you don't blanch it, you will lose flavor and color. 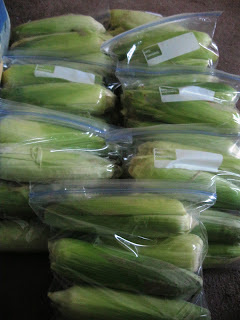 I do use this method if I find a great sale on corn from the store, but if I get some from a farm or farmers market, than I do this quick & easy method. I have frozen them for up to 9 months and once cooked they still taste like fresh picked corn, but the key is to get them in the freezer as soon as you can after they've been picked. Jan's Tip: See the bottom of the post for my favorite cooking trick! Comes out super delish, every single time, and super easy! 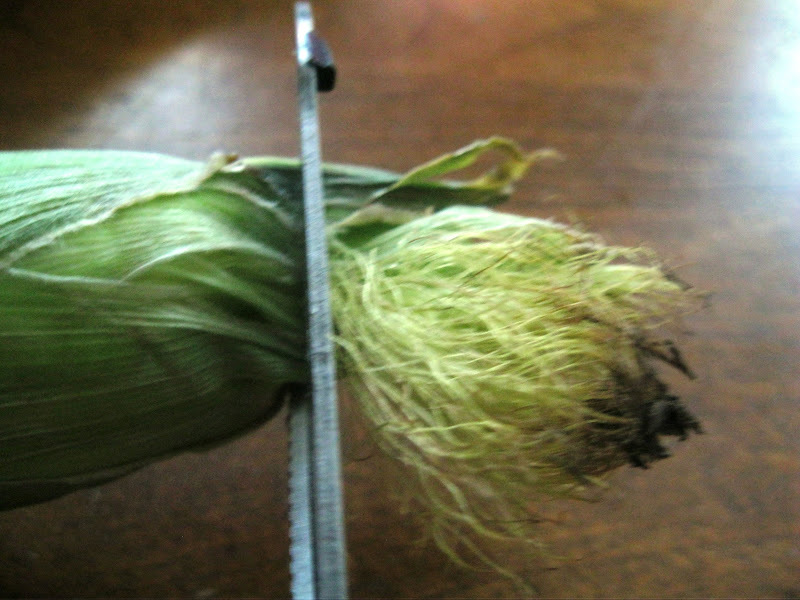 Snap off the "handle" end of the corn. If you want to you can peel off the first few "uglier" husks. but don't unpeel too much. This is only for cosmetic reasons. I peeled them off in the picture below. I can fit 6 full sized ears in a gallon sized freezer bag. Get as much air out of the bag as possible. Freeze for up to 6 months. Pull the corn from the freezer 8 hours (I pull it in the morning, or night before) and store in refrigerator to thaw. 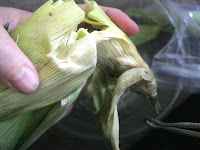 my favorite method: Cook the corn in the oven right in their husks! Preheat oven to 350 degrees. Put corn with husks still on directly on the oven racks. Cook for 30 minutes or until corn is soft. Remove from oven, and carefully peel off the husks. The silks and husks will all just fall right off! Butter and salt as desired!